It's Tuffet time!!! Make your own upholstered low seat or stool. You can make an 18 in. 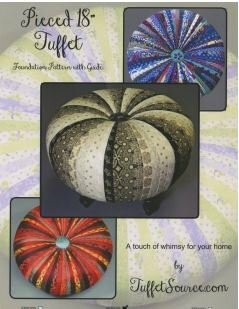 tuffet with your own choice of fabric. We will have the pattern and hardware kit for you to purchase. Be sure to read the supply list carefully. You may stay and sew for the rest of the day after the first class. -Extra machine needles ,Please have a NEW Microtex 70 or 80 in your machine, these work best because of super sharp point. This pattern is NOT for upholstery fabric, good quality quilt weight cotton works the best. * One strip set, jelly roll or bali pops of 2 1/2" strips, do not trim to 2"